The Environment Portfolio will be introducing Trash Free Tuesdays, where students are encouraged to bring a trash-free lunch every Tuesday. Every piece of packaging or excess food that we can save from landfill makes a difference. 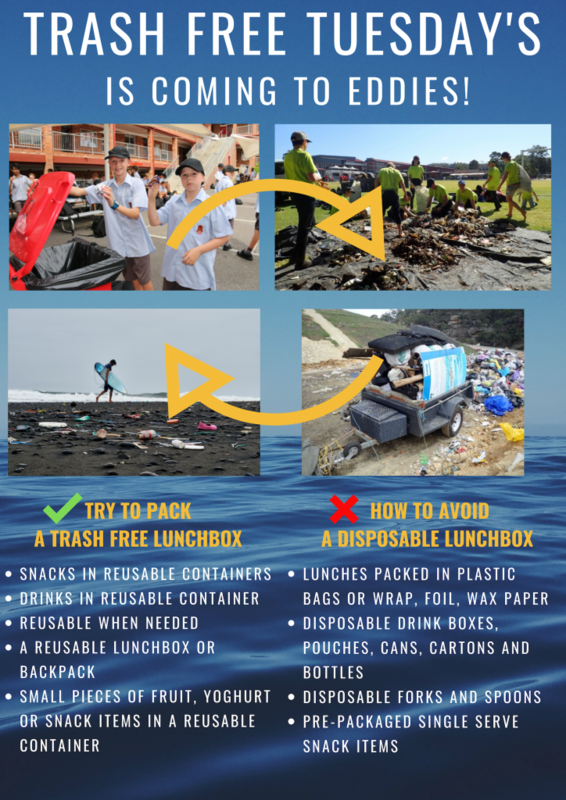 As part of our commitment to the environment we are going to hold Trash Free Tuesdays, commencing on Tuesday 30 April (Week 1, Term 2) to focus on reducing the amount of packaging material that we send to landfill. Senior students will visit tutor classes and mark off any student who has a Trash Free Lunchbox. Students who participate in the challenge will go into a draw to win a weekly prize which will be announced at Friday’s assembly. There will be another Return and Earn collection next Wednesday 10 April. Students can return their bags to the front of reception between 8.00 am and 8.30 am. Remember 2 Waterford Hours and 2 Tatham points will be awarded to each full orange Return and Earn bag. Let’s see if we can divert more than our last collection of 1,435 containers! If you would like an orange bag please see Mr Gentle.